We have information about the Palace in one sentence of the “Signori della notte” (lett. Lords of the nights) to the “Criminal” (the Venetian Republic’s courthouse) on the 9th of February 1372. 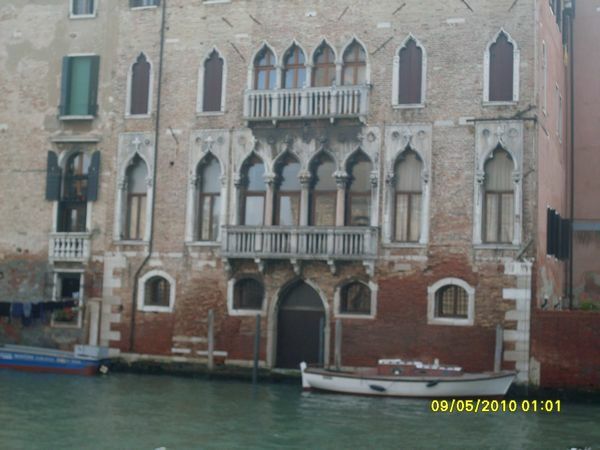 But the dating of the Palace’s facade on the canal appears to be subsequent (1450-1460). The Palace belonged to the Pesaro, a patrician family. After the marriage of Bonifazio Papafava to Pesarina Pesaro in 1625, the Palace was called Pesaro-Papafava. Then the Palace was inherited by the Papafava family. Bonifazio was a knight of the Redentore brotherhood . He came from a rich Venetian family , for this reason it was conferred the patrician title upon him on the 22th of December 1652. This title allowed him to exercise power in the political and economical sphere of the Serenissima (the Republic of Venice). The Papafava Palace constitutes an interesting repertoire of art from the 14th to the 18th century. It is an ogival building in gothic style. The precious facade that looks at the canal of the Misericordia, lying at the back, has a special worth. This facade is ennobled by the elegant quadriform gothic windows, with jutting balconies and balustrade in the shape of high little columns. It reminds the Ca’ Foscari Palace for its great regularity. The ceiling of the central hall, in the style of Sansovino, was set up and incised at the end of the 16th century at the same time of the marble wall of the doors. In the early years of the 18th century the ceiling of the Beatrice room was painted by order of the daughter of Bonifazio Papafava, and she was very keen on hunting. Because of the previous uses of the Palace, it was chosen the technique of the fresco with the Venetian themes, lacking in any reference to spaces and places.